Researchers at Carnegie Mellon and EPFL have devised a new computational design tool which turns a flat sheet of plastic or metal into a 3D shape with hexagonal slits. Using a combination of 3D printing and the new technique, the researchers were able to create a high-heel shoe and other objects. Consider the rubber band: its most obvious and important characteristic is its stretchiness—pull it tight enough and you even have a handy weapon at your disposal. But while a rubber band stretches in one dimension, it actually contracts in another, becoming thinner the more it is stretched. This behavior is, in fact, typical of most stretchy materials. A new discovery made by researchers at Carnegie Mellon and the Swiss Federal Institute of Technology in Lausanne, Switzerland (EPFL) is therefore particularly interesting: these researchers have devised a computational design tool which enables flexible but non-stretchy materials to expand uniformly in not one but two dimensions, a process which could prove useful in biomechanics, architecture, and other fields. The new computational design tool is able to turn flat sheets of “auxetic” materials, such as flexible plastics and metals, into 3D shapes. One of the ways it can do this is by making hexagonal cuts into the material, producing rotating triangular elements which enable the material to expand uniformly in two dimensions—up to a certain point. “We’re taking a flat piece of material and giving it the tendency, or even the desire, to bend into a certain 3D shape,” said Keenan Crane, assistant professor of computer science and robotics at Carnegie Mellon and one of the researchers on the project. While 3D printing has enabled manufacturers to create 3D objects with new materials, the researchers believe that their new technique, which folds pre-fabricated materials instead of building shapes from the ground up, could provide a further option for designers in a range of industries: “The ability to design complex objects from auxetic materials could have a wide variety of applications in biomechanics, consumer goods, and architecture,” said Mark Pauly, professor of computer and communications sciences at EPFL. In order to explore how their new fabrication method could be used to create single-curved and double-curved structures, the researchers worked with EPFL Ph.D student Mina Konaković, who used conformal geometry—studying maps between spaces where lengths uniformly shrink and expand—to map the surfaces of the auxetic materials. Konaković commented that auxetic materials and conformal geometry could work in tandem, but cautioned that real physical materials can only expand so much. The researchers were able to create 3D objects using the new design tool, which can determine the pattern of slits necessary to achieve the desired 3D shape before making the perforations with a laser cutter. 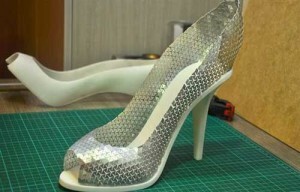 Using this technique, the researchers were able to create 3D objects such as a sculpture, a fashion top, a lampshade, face masks, and a high-heel shoe which also featured a 3D printed sole, demonstrating that the 3D fabrication technique could be used in conjunction with 3D printing to create digitally designed, multi-material 3D objects. At present, there are some limitations to the researchers’ method. To create their 3D face masks, for example, the researchers had to place the perforated sheet of material over the cast of a face before pressing it to form the appropriate shape. In future, the researchers believe it would be possible to use materials which automatically pop into position instead of requiring manual sculpting after the cutting phase. The new computational design tool will be demonstrated on July 27 at the International Conference on Computer Graphics and Interactive Techniques (SIGGRAPH) in Anaheim, California.